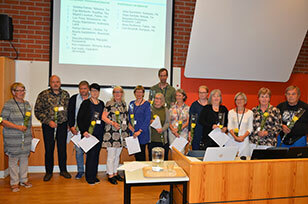 The Federation of Finnish Allotment Gardens held its four-yearly Congress in Tampere 5th-6th August 2017. One of the congress delegates and continuing member of the Executive Board, Ms. Marjukka Metsola from the northernmost allotment garden in the world in Rovaniemi, summarised the Congress on the Finnish Federation's Facebook-page: "Lively discussions, several views. Finally we made the important desicions. Democracy works!" 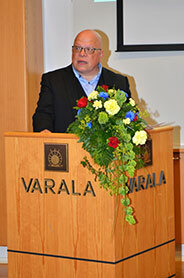 The Congress unanimously re-elected Mr. Pertti Laitila as President of the Finnish Federation. Pertti was elected President in the previous Congress in Forssa in 2013. Before that he had been a member of the Executive Board in 2010-2013. Pertti is an experienced allotment gardener. He has been a member of the association Nekalan Siirtolapuutarhayhdistys in Tampere since 1995 and actively taken part in the administration of the association since 1996. The newly elected Executive Board represents 37 % of the Federation's member associations and the geographical representativeness is excellent. The first meeting of the new Executive Board will take place on September 5th. In that meeting the Board will appoint the two new Vice-Presidents, the new Management Committee and various working groups. Leena Heino from Tampere is the Honorary President of her association Litukan Siirtolapuutarhayhdistys. She has been working for the improvement of allotment gardening in her own association, on a regional basis and also nationwide. Liisa Vasama from Helsinki was the President of the Finnish Federation in 2001-2009. During her presidency Liisa actively improved the Federation and many allotment gardeners remember her sympathetic editorials in the Federation's magazine. Liisa Vasama is also highly respected internationally. In Finland the year 2016 has been a Green Year, appointed by the Ministry of the Environment. The aim of the year was to stimulate individuals, communities, organizations and companies to work for a better and more comfortable living environment. The theme of the year was 'My landscape in the countryside and in the city'. This was the fifth Green Year – the previous have been arranged in 1985, 1995, 2000 and 2008. The closing event of the Green Year was arranged October 27th 2016 in the prestigious House of the Estates in Helsinki. During the event there was a ceremony, where 26 individuals, organizations and companies were awarded with a Green Year Medal. 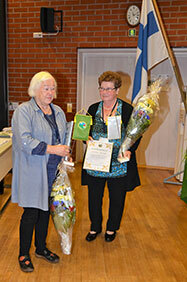 One of the awarded was The Finnish Federation for Allotment Gardeners. The Federation received the medal for "its meritorious work for an environment important, healthy and comfortable for everyone". 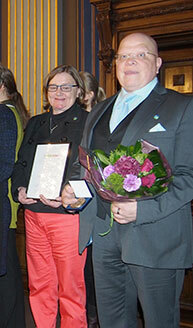 The medal was received by President Pertti Laitila and Administrator Tina Wessman of the Finnish Federation. 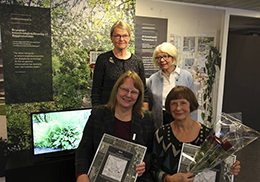 The Building Control Department of the City of Helsinki has given the honorary award 'The Rose of Building' to the allotment association Brunakärr Koloniträdgårdsförening's building committee. The rationale was "For active promotion of the allotment institution and profound instructions on how to make an old leisure activity tradition blooming in the middle of the hectic city." The association has strived to save the values of the allotment site by composing a report on the history. Based on the report they made a map guiding the placement of the cottages and both building instructions and model blueprints for the cottages. In the report there is an inventory of all garden plants, from trees to summer flowers. The several types of cottages in the blueprint aims at enlarging the old cottages, which gives an excellent base for retaining the scale of the site, materials used and details. The history report also gives a solid basis for the city planning. Brunakärr Koloniträdgård is situated in Ruskeasuo (Brunakärr in Swedish), approximately 5 kilometers from the city center and consists 114 parcels of various sizes (100-700 m2). Brunakärr Allotment Garden, founded in 1918, is the oldest allotment garden situated at its original site in Finland. When the site was founded, it was situated far in the outskirts of the city. Nowadays it makes a green oasis squeezed in between one of the main streets, new business buildings and a bus depot. In the zoning plan of the City of Helsinki the site is mentioned as an green area with importance to both cultural history and architecture. [IMAGE Front from left to right: architect Ebba Michelsson and landscape architect Camilla Rosengren.